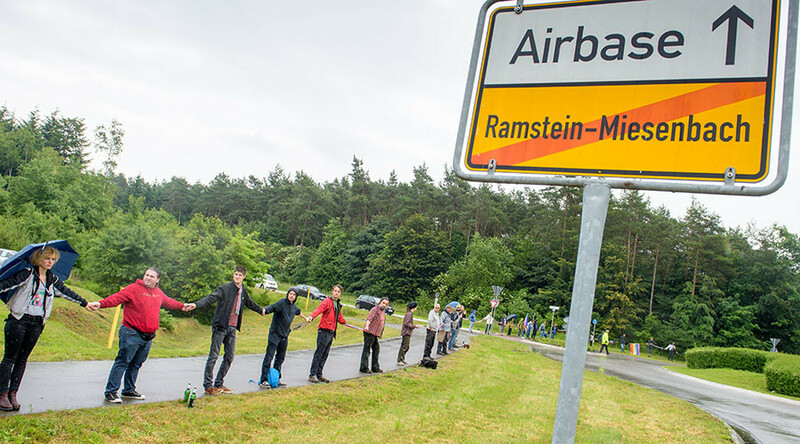 Thousands of demonstrators protested against US drone operations at the Ramstein Air Base in southwestern Germany, later forming a human chain around the perimeter of the facility. About 1,500 people joined the initial rally at the base of a rural part of Rhineland-Palatinate demanding that the facility no longer be used in drone operations conducted by the United States in such countries as Iraq, Yemen, Syria, Afghanistan and Pakistan. The protest was organized by the civil movement “Stop Ramstein - No Drone War,” which says that the base, the principal US Air Force facility in Europe located close to the city of Kaiserslautern, is used to transmit information between the drones in the Middle East and their operators in the United States. The organizers also stated that using the German base for transmitting data for drone operations goes against the German Constitution and demanded that the base satellite relay station be closed. The protesters were holding placards and banners that read "Most people want to live in peace," "He who sows war, will reap refugees," “No NATO,” “Peace” and “We do not want to be accomplices in your wars.” They were also waving rainbow flags and bands. Former German Finance Minister Oskar Lafontaine, who also was the head of the German Social Democratic Party in the 1990s and a co-chairman of the Left Party in the 2000s, also joined the peace rally at the base. He said that the US drone program violates international law and criticized the current German government’s stance on the issue. "It‘s intolerable that the government remains silent," Lafontaine said, adding that it is "schizophrenic" that Berlin welcomes refugees and supports the wars led by the US in their countries of origin, dpa reports. Later on Saturday, thousands of people also formed a human chain stretching up to 9 kilometers around the perimeter of the base. According to police estimates, from 3,000 to 4,000 people took part in the action, while the organizers put the number of the demonstrators forming the chain at 5,000-7,000 and called the event the biggest protest against the base, Reuters reports. "The chain is not complete but it is a sign! Ramstein needs to be shut down,” an MP from the Green Party, peace activist Reiner Braun said, as quoted by Deutsche Welle. At the same time, an MP from the Green Party, Tabea Roessner, warned that the drone strikes radicalize people in the Middle East. In 2013, it was revealed for the first time that the US uses its military bases in Germany to conduct targeted drone killings of suspected terrorists, when the former US drone operator Brandon Bryant first made his revelations in the interviews to the German media. In 2014, he disclosed that Ramstein Air Base was used by the US to wage highly controversial drone warfare in Africa, Yemen, and Pakistan. Data from the remote controlled drones is transmitted via satellite to Germany and then sent back to the US via fiber optic cable, Bryant said at that time, suggesting Ramstein is the nerve center behind the operations. The United States has repeatedly denied that its German base, which houses over 600 personnel, is directly involved in the strikes. In the meantime, Bryant’s revelations about Ramstein ended up highlighting the existing debate and criticism in Germany and elsewhere about the human collateral damage and legality of US drone warfare.